To say that I’m obsessed with Matthew Williamson’s S/S 11 parachute silk maxi dresses is an understatement of divine proportions. It’s like saying a Chanel bag is timeless — sure, it’s a true statement, but it doesn’t even begin to capture how deeply true it is. The romantic billowing of the fabric, the bright spring colors and the floor length are a lethal combination (see 10:40 in the video). This got me thinking about the prevalence of bright- and neon-colored maxis this spring. Even at the Met Gala — a formal evening event — popping shades were a popular option. But alas, not all of us have $1,695 to spend on a Matthew Williamson dress, or an event like the Met Gala to attend. 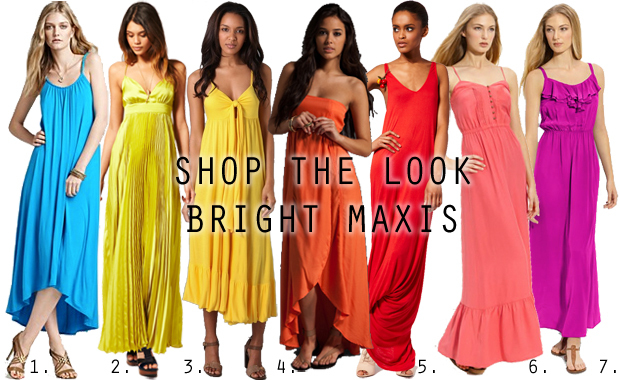 Bright maxis are a great and wearable summer option, with a little interpretation! Look for simple silhouettes in light fabrics like jersey and silk, which also add to the flow-factor of your dress. A feminine ruffle or trendy pleat add interest to a monochromatic piece of clothing. Style with neutral wedges, flatforms or sandals and add some wooden jewelry (bangles, tribal necklaces) for the ultimate laid-back, sun-kissed style! I’m totally with you on this–the brightly colored maxis are to die for! Love this post!